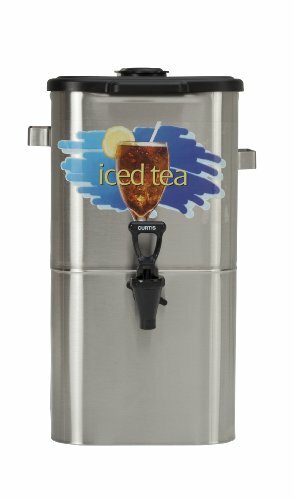 PRODUCT DETAILS: Wilbur Curtis Iced Tea Dispenser 4.0 Gallon Tea Dispenser, Oval 17”H - Designed to Preserve Flavor - TCO417A000 (Each). ALL Stainless-Steel Construction Never Cracks or Discolors - NO hard-to-clean and expensive to replace plastic liner. This tea dispenser is easy to carry and transport. Welded-On Stainless Steel Handles - NO screws or plastic. Advanced interior components help keep preserve the temperature of your tea. Contemporary, Rounded Design - ELIMINATES sharp edges and corners. This commercial tea dispenser is popular in fine restaurants, hotels and other food service locations. ALL Stainless-Steel Construction Never Cracks or Discolors - NO hard-to-clean and expensive to replace plastic liner..
Welded-On Stainless Steel Handles - NO screws or plastic. Contemporary, Rounded Design - ELIMINATES sharp edges and corners. This commercial tea dispenser is popular in fine restaurants, hotels and other food service locations. The Wilbur Curtis name is synonymous with a full line of the world's most advanced, top-of-the-line commercial coffee brewing equipment, iced tea brewing systems and specialty beverage dispensers. Wilbur Curtis is the preferred beverage equipment provider of restaurants, hotels and other commercial food service establishments. Its products are designed to meet the durability and performance needs of food service professionals. Keep your best brews fresh and ready to serve for hours with this tea dispenser.